Growing you own food is an important skill to master for long term survival for you and your family. However, it takes some knowledge, some skill, a tilled plot of land or lots of pots on the patio! That’s why I wanted to give you some insights to encourage you to start now and learn what works best for you and your family. It also takes proper soil, sunlight, fertilizer and adequate water to sustain the plants. In this semi-arid area, it may be tricky to have enough water during a long term disaster to grow enough food, that’s why we suggest you have at least a year’s supply of food stored. Nevertheless, these are great skills to use to insure your family has the finest quality food now and learns an appreciation of what it takes to provide food that we all too often take for granted. What is the story on GMO vs non GMO food and seeds? Genetically engineered seeds (also referred to as GMO’s-Genetically Modified Organisms) mix genes in crops from unrelated organisms- for example genes from soil bacteria, fish etc., which could not have mixed through biological reproduction, and conventional breeding. Two techniques, ‘gene gun’ and ‘plant cancer’ are used to implant a foreign gene from an unrelated organism to the plant. In addition, antibiotic resistance marker genes or viral promoter genes are also added in this process. The “yield” of a GMO crop is the yield of the original plant into which the new genes were introduced. Hybrid seeds will not grow up to be the same plant on subsequent planting. The seed companies make hybrids so you can only get them from them. And they usually prohibit keeping seed or propagating ‘their’ plants. It’s important for you to stock up on heirloom seeds so you can propagate from one crop to the next, (take seeds from a harvested vegetable and replant and get the same version of vegetable) Try a nice heirloom tomato. They usually taste better and you can save seeds each year. And each year’s plants will be slightly more acclimated to your growing conditions too! I think you need to start with something that wasn’t available to North American tribes before Columbus: potatoes. They grow well in a wide variety of soil types, and easily provide a large harvest that stores well for year round use. This is one food you can virtually never have to buy from the store since, during “most” years, the new crop is coming on about the time you finish the last. As the Irish once proved, you can practically live on potatoes alone three times a day—provided you have them. It might not seem like a very interesting diet, but starving is even less appealing. It takes roughly 200 feet of rows to produce a full year’s supply of potatoes for a family of 6. You would probably need to increase that if other staples, like rice, were no longer available to us. Potatoes are a versatile root crop so they can seem intimidating to gardeners to try to grow. How do you plant potatoes? How do you know when a potato is ready to harvest if you can’t see them? Never fear, not only are potatoes easier to grow than most people realize, but they can often be ready to harvest in 12 weeks or less! The first step to harvesting organic potatoes is to purchase organic seed potato, if possible. I don’t recommend planting potatoes from your grocery store because they’ve usually been treated with chemicals to prevent sprouting. Also potatoes develop a disease called potato virus so seed potatoes are always grown and produced in areas where the virus cannot exist and are certified virus free which grocery store potatoes are not. When you get your sack of seed potatoes you might be surprised, as I was my first year, to see actual potatoes. This is the “seed” for the potato plant! I had no idea the first year I planted potatoes. Good seed potatoes will have at least 2-3 eyes per potato. If you have larger potatoes with many eyes on them you could cut them and grow two plants from one potato – just make sure that each chunk has not only 2-3 good eyes at minimum, but also plenty of flesh to help the potato grow. If you just cut the eyes out without enough flesh your potato will rot and not grow. Three, 25-foot rows turn into over 500 lbs of potatoes here – not a bad harvest for a big family! If you plant them in rows or raised beds, make sure you have space to cover them with surrounding dirt as they grow (more on that in a minute). One of the more productive ways to grow potatoes is in towers. One year we had an old set of tires left. I stacked them up, filled them with dirt, and grew potatoes right there. Growing them vertically freed up the extra rows for more tomatoes, which are in the same family as potatoes (nightshades) and fit within our crop rotation plan. Remember not to plant potatoes where other plants from the nightshade family have been – this includes eggplant, tomato, and peppers. Country wisdom says to grow potatoes where sweet corn has recently grown. The smallest seed potatoes with three eyes or less should be planted whole. Larger potatoes can be cut into at least one-ounce chunks, with at least two eyes on each section to be planted. When the cut side or sides have dried a bit and sealed over, plant them in amended soil 4-6 inches deep and 9-12 inches apart. In rows and sections, you’ll use your hoe to mound dirt over sections of the rhizomes as they sprout and grow. Don’t cover more than a quarter of the vine at a time, but steadily cover it as it grows to prevent the sun from reaching the potatoes. Sunshine on the actual potato will make it green, bitter and inedible. Cut your potatoes the day before and then plant them the next morning so any exposed flesh has a chance to dry a little before planting. This minimizes the risk of pests, disease, and rotting. If you haven’t cut any large potatoes you won’t need to do this. Potatoes are planted about 5-6 inches deep and should be spread 9-12 inches apart depending on the size of the chunk you are planting. Cover over the potatoes after you plant them and wait! You’ll start to see beautiful potato vines appear in a few days. The stems are pretty thick and the leaves are usually bright green. Let the vines grow until they are about 6-9 inches tall and then you’ll need to perform some quick work on the plants. Something called “hilling the potatoes”. It sounds scary and feels super counter-intuitive but all you do is rake up dirt from the outside of the rows (the middle part where you walk where there are no plants) and pull it up onto the potato plants. WHAT!? You want me to bury my potato plants? Yep. That’s exactly what you do. Bury half of the plant leaving just the top few inches of leaves exposed. The buried part of the vine will produce more roots, and most importantly, more potatoes. Meanwhile the still-exposed leaves will continue to produce energy for the plant and will continue to grow even bigger. In another couple weeks you will hill the plant up again, using either straw or soil to bury more of the potato plant. Potatoes are perfect garden occupants for the most part. They grow easily in a wide-variety of soil, as long as it’s well-drained. They are easy to grow, have beautiful vines and flowers, and produce loads of delicious edible harvest for you. We can transform one sack of seed potato into a hundred pounds of potatoes, or more. Enough to feed our huge family for quite awhile! When do you harvest something you can’t see? The vine tells you all you need to know about harvest time for potatoes. Once the tops have died and fallen over, you can start to dig the potatoes up and expect them to be ready. Know your potato plant – but 10 weeks is a good average for them to be ready. You can actually leave potatoes right in the ground, on the vine for some time, but you’ll need to get them properly stored. Until then, harvest potatoes as you need them, leaving the rest for storage time. Use your harvesting tools carefully, because a nicked potato can’t be put into storage. Gently dig the dirt away from the potatoes and pull them off of the vine. If the vine isn’t fully dead and you are just harvesting what you need for a day or two, you can shake and lift the vine gently to uncover the potatoes you need, then replace it after harvesting. Make sure they are completely covered with soil, as the sun exposure can be damaging. If you do catch a potato with your digging claw or hoe, clean it off and set it aside to be eaten soon. The others can go into storage. Harvesting potatoes is one of the most fun things ever….it’s like digging for buried treasure and the kids will love it. Potatoes keep incredibly well in cold storage, as long as the environment is right. Newly harvested potatoes have thinner skin than what we purchase in the store. For optimal storage potatoes should be left exposed to the air for a couple of weeks. You can spread them out on butcher paper in your root cellar or garage. If they are placed in direct sunlight, however, they will be likely to turn green and become inedible. 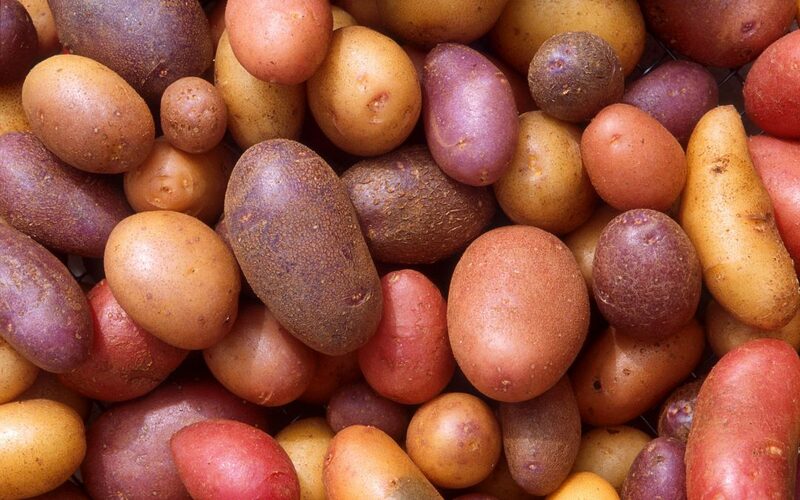 Other risks to your stored potatoes include broken skin, which can introduce mold, and apples, which give off ethylene gas that will spoil the potatoes. After curing the potatoes for a couple of weeks, the skin will be hard enough for it to be ready. Store in a cool, dark place, in the 35-40 degree range. For a quick cold storage solution, try burying a metal trash can and lining it with hay or butcher paper. Some store potatoes in a fridge, as well, though with your prolific potato harvest, you may need a bigger ‘fridge! After potatoes, corn is probably the next important survival crop. As every Future Farmers of America (FFA) kid knows, corn is grown in every state of the Union. Those without a farm background tend to think of “sweet corn” first when you mention this crop, but that really isn’t ideal for long-term storage. (However, if you have room to grow sweet corn, do so….nothing better in August.) What you need is field corn or a Native American variety made for growing to full maturity and drying on the stalk before storage. It will then require grinding into meal to be used for bread, tortillas or soup thickener. Like potatoes, corn is another crop that grows well under a lot of conditions and produces a relatively large harvest in a limited amount of space. If kept dry and away from rodents, it is one of the easiest crops to store for long-term use. Corn alone is not a totally balanced diet. The first step in correcting that is to add beans to complete the essential protein and fiber. There are a huge variety of different beans that can be grown, but, for me at least, picking one mostly depends on what produces best in my particular area. Here in the southwest, most varieties are successful year in and year out: I like Romano pole beans, (grow vertically), other green beans, pinto beans, etc. Chose according to your space and taste. For maximum lettuce production, it’s wise to select a site where the soil drains well, yet retains some moisture. The soil should also be rich in nitrogen and potassium, The best way to accomplish this is to work in plenty of organic matter (compost, rotted manure, or leaf mold) that will loosen and enrich the soil. Strive for a pH of 6.0 to 6.8. Most lettuce varieties mature in 45 to 55 days, allowing many gardeners to plant two or even three crops. But looseleaf and butterhead leaves can be harvested at just about any time in their development. Heading varieties take longer to mature. Romaine takes 75 to 85 days and crisphead 70 to 100 days. My favorite is “Black Seeded Simpson” leaf lettuce for ease of growing and for delicious, tender and tasty lettuce. Keep in mind that lettuce seeds won’t germinate in soil that is 80 degrees F. or warmer, so there’s no sense in sowing directly in the garden in the summer. Resort to starting heat-tolerant varieties indoors and moving the lettuce seedlings into the garden, preferably under partial shade, after they’ve developed a few true leaves. Great crop to grow in California from October through June (cooler months) and then in a window during summer months. By choosing the right varieties, it’s possible to have lettuce throughout the growing season. Squash, is another of the staple food crops that come in a wide variety of types. Look for the varieties labeled “winter,” a reference to their storing advantages. Most require a “curing” in the fall, but the best types will last up to six months in a cool, dark area. Other crops that turn up on a long-term survival lists are carrots, beets and parsnips. Not only are they full of all sorts of minerals and vitamins you need, but over-wintering them is also relatively easy. You just need to have enough loose soil for them to grow their deeper roots. A few basic herbs like these bay leaves, French thyme and oregano are easy to grow and spice up simple food dishes. After the basic food groups to keep you alive come the plants that will make a steady diet of corn, beans, potatoes, carrots, parsnips, beets and squash a little more bearable. I don’t care where you go in the world, you will find a small group of staples raised for that exact purpose: onions, garlic, tomatoes and chili peppers. Because they are easy to dry, chili peppers are probably the easiest to store for winter use. Chilies come in a huge variety of sizes, flavors and heats, so this isn’t about trying to make everything too hot for non-spicy food eaters to stand. You can match the planting to your personal tastes pretty easily. Both onions and garlic can be stored fresh in a cool, dark place for most of the winter, but it would be a good idea to dry extra for when they run out about late January. While under the right conditions tomatoes can also be dried, most of us depend on canned whole fruit and sauced versions. This, of course, will require canning lids and jars, something that are already expensive and might become very difficult to find during hard times. I consider canning lids one of big weak links in any long-term homestead subsistence gardening plan. Stock up now! Why grow tomatoes from seed? There are always plenty of tomato plants for sale at local garden centers, but in an emergency situation, you will need to consider growing tomatoes from seed. Since tomatoes are heat lovers, most gardeners don’t have growing seasons long enough to start tomatoes from seed outdoors. To get around that, tomato seeds are often started indoors, under lights. Organic Seed – Look for certified organic seed. Disease Resistance – If you know your area is prone to a particular disease, look for varieties with built in resistance. Heirloom Tomatoes – Great varieties for flavor. Plant Size – Many seed descriptions will tell you the mature size of the plant. In general, determinate plants tend to be smaller than indeterminate tomatoes. Small plants for containers often have names like ‘patio’ or ‘pixie’. The most simple explanation of the difference between determinate and indeterminate tomatoes is that determinate tomatoes bear their crop all at once, while indeterminate tomatoes bear fruit over the course of a season. Indeterminate varieties tend to grow longer vines and will require more support in terms of staking or caging over the course of a season. Determinate varieties often (but not always) tend to be more compact and manageable. Next on my garden plan would be a basic selection of easily grown herbs. French thyme is incredibly tough, and can withstand summer droughts in the large pot we have on our patio. Sage, bay laurel and rosemary are also hardy. The oregano planted in the rose beds reseeds each year with 100-percent reliability. The same goes for the coriander. Mints are another option that, once established, usually require time trying to control them. Unfortunately, the two most basic condiments, salt and black pepper, will be less easy to come by during really hard times. To me, a home can’t have too large a stash of salt when times get rough. Living your life mounding potatoes and shelling corn may not sound as romantic as becoming some modern-day mountain man roaming the forests living off fish and game, but it is far more realistic. The last 10,000 years of human civilization have proven that long-term subsistence will always depend on what you can grow, not what you can hunt. Worm Castings allow plants to quickly and easily absorb essential nutrients and trace minerals. This is possible because Earthworms grind and uniformly mix the nutrients into simple forms, which are easily absorbed by the surrounding plant life. Despite the fact that many chemical fertilizers list many nutrients and have higher laboratory analysis percentages, the nutrients are not broken down in such a way that the plants can readily use them. In addition to the abundance of available nutrients, worm castings also provide a perfect mix of nutrients that are available to the plants and vegetables for long term nutritional needs. This allows plants to feed as needed for weeks and months at a time, as the worm castings release their precious nutrients into the surrounding soil. Chemical fertilizers usually provide only synthetic nutrients, much of which are quickly lost into the soil during watering. Since the plant’s root system can absorb only so much material over a given period of time, much of the value of this nutrient flow is wasted. Chemical fertilizers are also detrimental to soil microbiology, frequently bypassing and sometimes destroying much of the beneficial microbial and bacterial components of the soil. At the same time, many of these synthetic nutrients are absorbed indirectly into your plants and food. The particular structure of Earthworm castings is such that it promotes soil aeration because it doesn’t pack together when mixed in soil. As a result, you get a much more “open” soil, which in turn promotes rapid plant growth. In addition, Earthworm castings improve soil drainage, cutting down on water-logged soil which promotes root rot, And, since Earthworm castings contain absorbent organic matter (bio-humus), the soil’s water retention capacity improves. I’ve discovered a great source for worm castings from our local Farmer’s market. She will give us a nice price on them and if you decide you want to order, she will deliver to us so we don’t have to go to Sunday Market to purchase.